Today MSC Cruises signed a contract with Fincantieri for the construction of two new cruise ships with an option for one more. The signature took place at the Palazzo Chigi in Rome between MSC Cruises and Fincantieri in the presence of the Italian Prime Minister Matteo Renzi, MSC Cruises Executive Chairman Pierfrancesco Vago and CEO Gianni Onorato, and Fincantieri CEO Giuseppe Bono. The two new ships will cost €700 million each, and will be funded with the support of the insurance and financial company SACE. The two ships will be delivered to MSC Cruises, owned by Gianluigi Aponte, at different times: the first in November 2017, the second in May 2018. 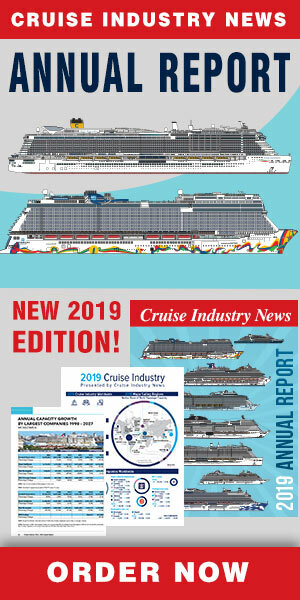 With a length of 1060 feet, a width of 135 feet and a height of 230 feet, the new ships will have a gross tonnage of 154,000 tons and will accommodate up to 5,300 passengers plus 1,413 crew members. The ships will boast 2,070 guest cabins, 759 for crew members, and 468,230 square feet of public areas available. Innovative in design and versatility, the new ships will be able to dock in any port around the world. Giuseppe Bono, CEO of Fincantieri, declared, "This is a special day for us. Today is the start of an ambitious and new adventure with our friends from MSC, a group that prides itself on its quality and Mediterranean style. These ships, which represent a genuine design challenge, will be developed entirely by Fincantieri, confirming our technological supremacy over other shipbuilders globally. Our commitment to innovation covers all high value-added sectors, thanks to the involvement of more than 2,000 technicians and 160 employees dedicated to basic research, as well as a partner network of Italian and European centres of excellence. This core asset is what makes our group unique in its kind in the world, and allows us not only to reaffirm our leadership in a sector as complex as the cruise one, but also to count on a substantial order backlog that bodes well for a full recovery in our business." "Today, MSC Cruises adds the last piece to its new industrial plan that will allow us to double the capacity of our fleet by 2022. With the arrival of the new ships we will reach a capacity of about 80,000 passengers a day," said Gianni Onorato, CEO of MSC Cruises. "As of today we have launched an investment plan of over €5 billion that includes new builds, ordered in Italy and France, and the conversion of four ships already in the fleet." The ships will be built to sail to the most sought-after warm weather destinations in the Mediterranean, South America and Caribbean.